Address: Guanapay, 2, Puerto del Carmen (Lanzarote), Islas Canarias. 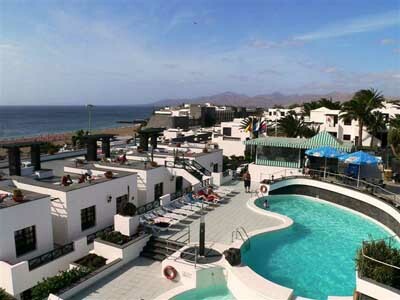 Apartamentos La Moraña are located 50 metres from Playa Blanca in Puerto del Carmen. The complex has an outdoor pool, heated in winter, and apartments with a private terrace or balcony. All Moraña apartments have a kitchen with a fridge, electric hob, microwave and coffee maker, and a bathroom with a hairdryer. The seating area has a TV with satellite channels. A safe can be hired. There is a children’s area in the outdoor pool and you can relax on loungers on the terrace, which offers panoramic ocean views. There is also a poolside bar serving breakfast, snacks and drinks. The complex has a tour desk where staff can provide information about the surrounding area and help guests to hire cars or bicycles. Free Wi-Fi is available at the reception. There is a golf course 2 km from Apartamentos La Moraña, and various watersports facilities can be found on the beach next to the complex. Tennis and squash courts can also be found nearby. Guests are required to show a photo identification and credit card upon check-in. Please note that all Special Requests are subject to availability and additional charges may apply. Please inform Apartamentos Moraña in advance of your expected arrival time. You can use the Special Requests box when booking, or contact the property directly with the contact details provided in your confirmation. Please note that the reception is open from 08:00 until 24:00. From 24:00 to 08:00 there will be a security person on site. Please note the outdoor pool is heated from November to March. Please note that Wi-Fi is available in the reception area. Please note American Express cards are not accepted. If you are not the owner of the credit card used to make the reservation, please contact the property in advance. Please note apartments are cleaned 4 times a week and towels are changed twice a week. Bed sheets are changed once a week.